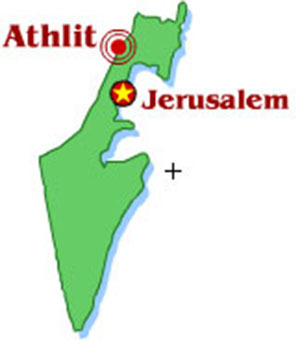 The Athlit ram, a bronze ramming prow from a 2nd-century BCE Roman galley, was discovered by an archaeological survey team in 1980 off the coast of Israel at Athlit Bay (just south of Haifal hover over the map to enlarge). 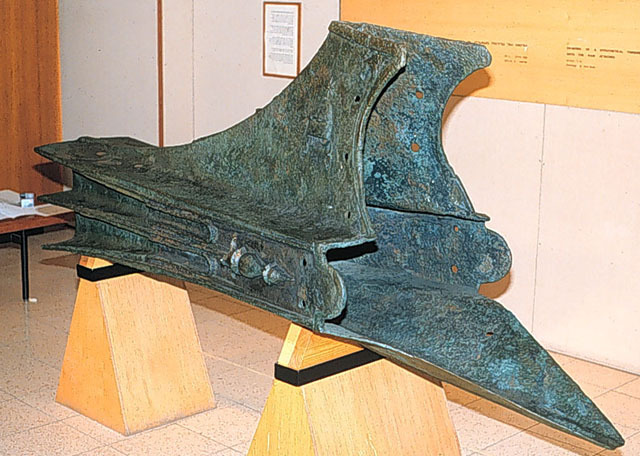 The ram is the only known surviving fully intact example of this ancient naval weapon. It's made of a single casting of bronze weighing 465kg (c.1000lbs) and measuring about 2.25m (about 7' 5") long. The ram is thus one of the largest bronze objects to survive from the ancient world. The ram is currently on display in the National Maritime Museum, Haifa, Israel (photo © and courtesy of William Murray; used with permission; hover over to enlarge). 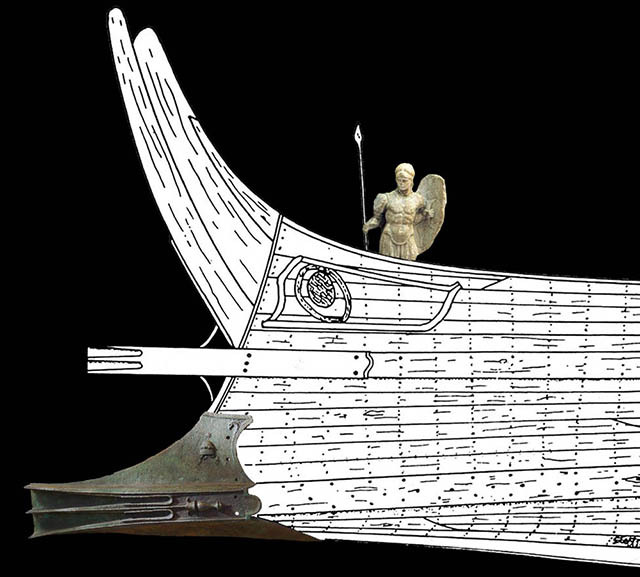 It was probably meant to fit on the prow of a medium-sized oared warship (probably a quadrireme or trireme; as depicted at the left; image © and courtesy of William Murray; used with permission; hover over to enlarge). The ram was designed to transfer the force and momentum of the attacking ship directly to the enemy ship’s hull, while maintaining the full integrity of the attacking ship. 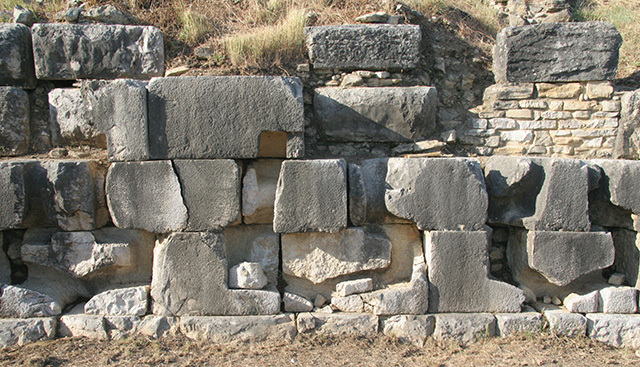 A theory posited (to the Institute for the Visualization of History) by William Murray and others supposed that the negative shapes cut into the long front wall at Octavian's battle monument at Actium, Greece, seemed to match closely the general shape of the back of the Athlit ram (see the image of sockets 3-5 at Actium at the left; image © and courtesy of William Murray; used with permission; hover over to enlarge). 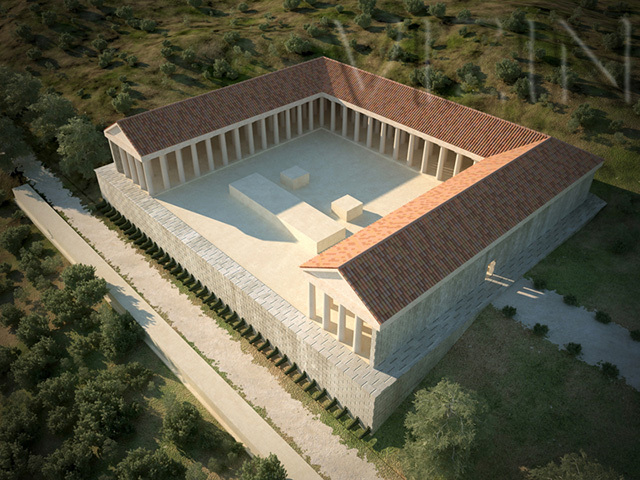 Building a virtual reality model of the Athlit ram was chosen as the starting point toward understanding the significance of the socket cuttings on the long wall below the battle monument at Actium, Greece (see the screen grab at the left from the virtual reality model of the Athlit ram, showing a shape very similar to the cuttings at Actium; hover over to enlarge). Since the Athlit ram is the only completely surviving example of that weapon, and it seemed that similarly shaped rams could once have adorned the wall at Actium, we needed to build an exact 3D computer model of the Athlit ram to use as the basis for testing that theory. 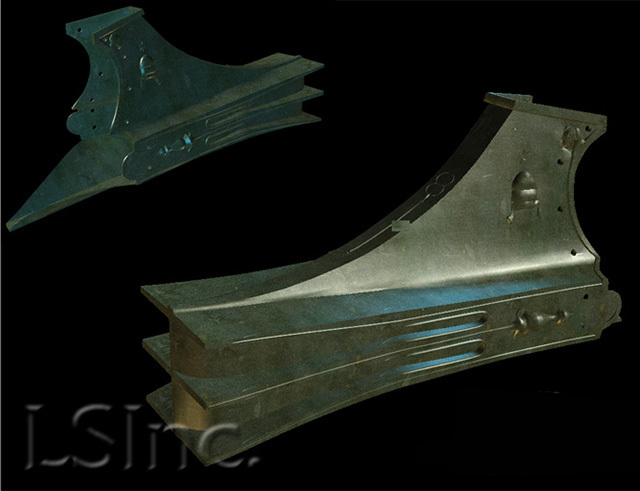 Based on detailed drawings of the Athlit ram (published by Richard Steffy), we were able to create an accurate and precise 3D computer model of it. Below is the result of our initial modeling (if your browser does not support the video tag, please download the PDF to view it). Your current browser does not support the video tag. Modeling the Athlit ram was crucial first step in our understanding of the size and shape of ancient Roman rams so that we could begin to determine the size and shape of the rams that once projected from the monument at Actium, Greece. 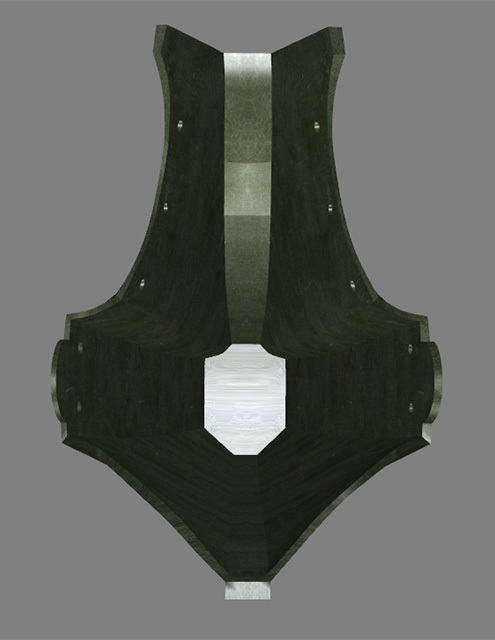 We used the Athlit ram 3D model as a starting point, and then warpped its surface carefully and proportionately until the new shape fit our test socket #4 in the wall at the Actium monument. The morphing worked perfectly. With the new knowledge of one of the actual rams from the monument, we moved from socket to socket until we know the shapes and sizes of each original ram (which will, in turn, inform scholars about the sizes of the original warships, and thus, for the first time, about the composition of Antony and Cleopatra’s fleet; see the resulting 3D model reconstructing the Actium battle monument at left; hover over to enlarge). Casson, Lionel and J. Richard Steffy, eds. 1991 The Athlit Ram, College Station, Texas: Texas A&M Press. 2006 "The Athlit Ram Bronze Casting Reconsidered: scientific and technical re-examination,"Journal of Archaeological Science 33.1:63-76. 1992 Wooden Ship Building and the Interpretation of Shipwrecks, College Station, Texas: Texas A&M Press.